This is the first in a series of posts touring Winnipeg neighbourhoods through crime fiction. Winnipeg writer Allan Levine had a history Ph. D under his belt, a day job, and a promising freelance writing career when he decided to write a mystery novel, The Blood Libel, set in turn of the century North End Winnipeg. It was 1997 and there were almost no other Winnipeg mysteries in bookstores, so Levine was a pioneer of sorts. He wrote two more books featuring his North End hero, Sam Klein: Sins of the Suffragette, and The Bolshevik’s Revenge before turning to New York City for the setting of his, so far, last mystery novel, Evil of the Age. Meanwhile, Levine’s non-fiction books have been praised both for their readability and their erudition. His most recent, a biography of Mackenzie King, won the Alexander Kennedy Isbister award for Non-fiction in 2012. CM: Prior to publishing your first Sam Klein mystery, The Blood Libel, in 1997, you had written mostly political history and been successful at that. What made you want to write a mystery novel? AL: I had always wanted to try writing fiction and was looking for new creative writing opportunities. I had no intention of attempting to write a serious novel, but historical mysteries, of which I had read many, did appeal to me. At first, I approached The Blood Libel like a non-fiction book and did a lot of research amassing the historical details that are necessary to bring the time period to life—including all of the mundane aspects of daily life that few of us really think about yet can enrich a work of fiction. I later learned that serious readers of historical mysteries pay close attention to this. When I started, I knew the basic outline of the story—and, in fact, purposely set the book in 1911 when a real blood libel trial took place in Russia–who committed the murder and why. But much of the rest of the plot and characters were developed as I wrote. In later novels, I mapped out the entire story ahead of time and found that approach much more effective. The one thing I did want to do was name the two major characters, Sam and Sarah, after my two maternal grandparents. CM: When The Blood Libel was first published there were almost no mystery novels set in Winnipeg. When you approached publishers, were they receptive to a book set in Winnipeg? AL: That was not much of an issue because at the time I was working on another project with Greg Shilliday of Great Plains Publishers in Winnipeg that dealt with Manitoba history. He and I discussed the idea and decided that a mystery set in Winnipeg at the turn of the century during an immigration boom could be just as successful as one set in New York City’s Lower East Side. Hence, I did not have to shop the concept around to other publishers. Interestingly enough, the Winnipeg historical setting proved to be a feature of the book that reviewers and readers liked, and that included in Germany when The Blood Libel and the Sins of the Suffragette, the second in the trilogy, were published there. German readers found Winnipeg’s immigrant history quite fascinating and exotic. CM: The old North End is no longer the centre of the Winnipeg Jewish community in the way that it was in Sam Klein’s time. What role, if any, did nostalgia play in your creation of the setting in the Sam Klein books? AL: I had researched and written about Winnipeg and the North End, prior to The Blood Libel. It is important to write about a period and setting that you are knowledgeable about, especially when doing historical fiction. It made sense to me to make Sam Klein a Jewish immigrant and integrate the various issues around Winnipeg’s small but growing Jewish community as well as the urban problems created by the influx of non-Anglo newcomers. Prejudice and discrimination were endemic in Winnipeg and Canada well into the twentieth century and I made a point of dealing with this through the characters in the book. I don’t know if this was in any way a nostalgic consideration as much as being interested in the world my grandparents grew up in. CM: Are you finished with Sam Klein? AL: Good question. 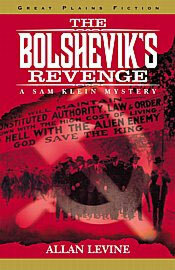 The last Sam Klein novel, The Bolshevik’s Revenge was published more than a decade ago. For a variety of reasons, I decided to stop and later wrote a fourth mystery, Evil of the Age, set in mid-nineteenth century New York. After that, I became involved in several big non-fiction projects and still am. My next book being published this September is Toronto: Biography of a City, a three-year undertaking that examines the growth of Toronto from a provincial town to Canada’s largest city. Though I did live in Toronto many years ago as a graduate student, it will be interesting to see how a book about the city by a Winnipegger is received. I would add that I do have another Sam Klein mystery in my head that takes place in the 1920s, so who knows…. I sure hope that Alan also has an update to ‘Scrum Wars’ in his head. Levine is quite prolific, so I wouldn’t be surprised if he has a similar book on the back burner.